Angus began life as Lawrence Rory Guy in Kansas City, Kansas in 1926, but moved to California in his teens where he ended up studying drama at USC. He subsequently found work as a writer, for TV Guide, Cinema Magazine and others, and also doing the liner notes on albums for everyone from Frank Sinatra to the Beatles, even winning a Grammy. Angus ultimately worked his way into theater, television and film, first collaborating with Don Coscarelli in 1976 on a feature entitled, Jim, the World’s Greatest. 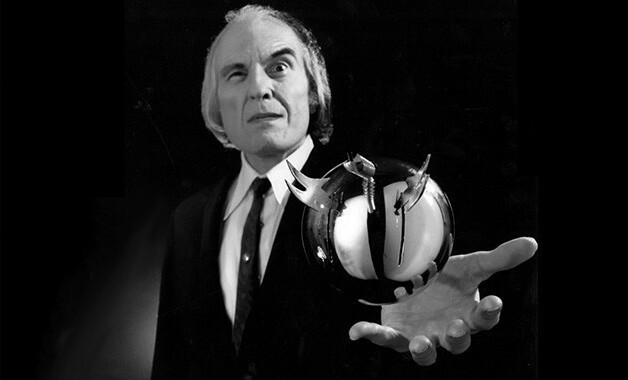 It would be three years later that Scrimm began the indelible role that would make him famous to horror fans the world over, that of the menacing Tall Man in Phantasm (1979). Imposing, mysterious, terrifying and deadly, the Tall Man remains one of horror’s most enduring villains, in a franchise that has continued to stay true, original and fresh in an age when remakes, reboots and re-imaginings are the norm. Angus has portrayed his otherworldly figure through four films, with a fifth, Phantasm: Ravager due sometime later this year. 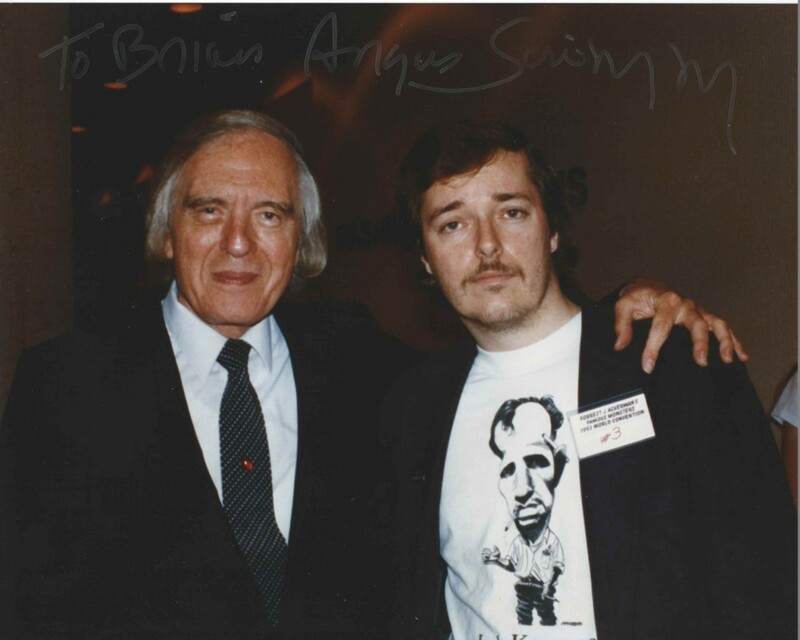 Scrimm also had roles in a number of other genre films such as Subspecies, Mindwarp, Wishmaster, I Sell the Dead, and Coscarelli’s Masters of Horror episode, Incident On and Off a Mountain Road and his most recent directorial effort, the mind-bending John Dies at the End. Angus also had a recurring role on J.J. Abrams spy thriller, Alias. 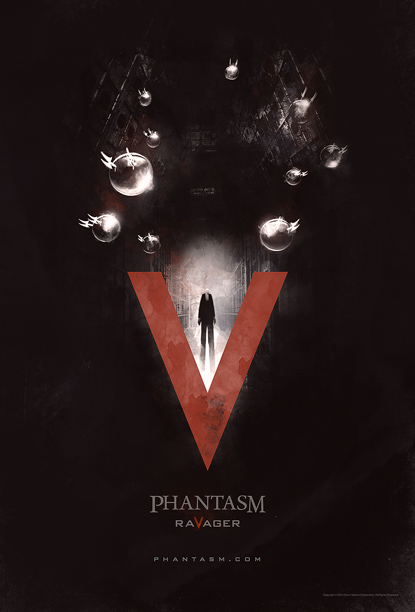 J.J., a big Phantasm fan, is currently overseeing a high-def restoration of the original film which we’ll see down the road. His love for the franchise is evident in the name of one of the characters in Star Wars: The Force Awakens, Captain Phasma. 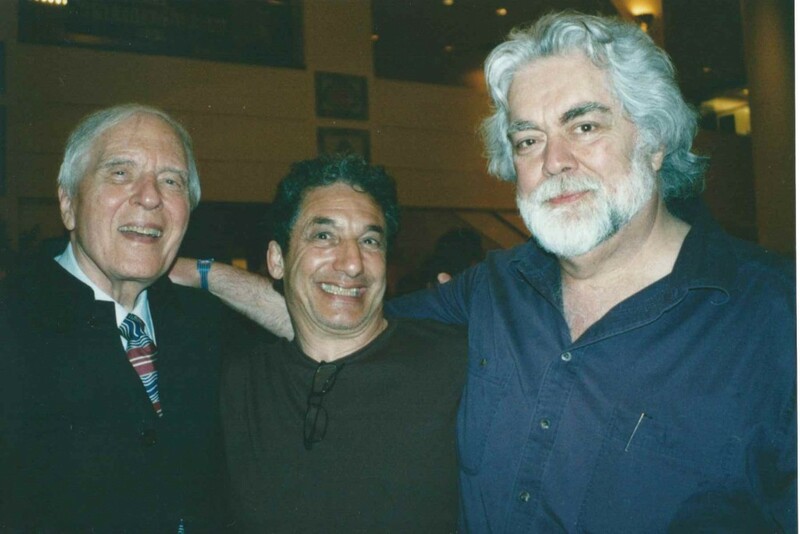 We’ll leave you with this exclusive Gore 4 shot of three late horror icons from one of their convention appearances: Phantasm’s Angus Scrimm, with Last House on the Left’s David Hess and The Texas Chainsaw Massacre’s Gunnar Hansen. A fitting tribute to the Tall Man. 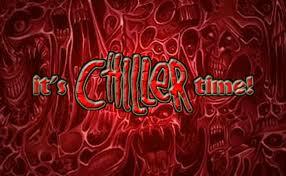 He was truly an iconic figure in the genre and one of my favorites. Among the Pinheads, Jasons, Freddys, Michael Myers… he stood above them all. Angus will be missed. R.I.P., Tall Man. And don’t let the little crushed dwarfs get you.